Pakistan 6-149 (Nasir Jamshed 55, Kamran Akmal 32, Mitchell Starc 3-20) beat Australia 7-117 (Michael Hussey 54*, George Bailey 15, Saeed Ajmal 3-17) by 32 runs. Australia surrendered to the destructive spin bowling of Pakistan and lost the important match against the Green Shirts in the ICC World Twenty20. Pakistan accumulated 149 runs with four wickets in hand at the end of the allotted 20 overs and Australia was restricted to 7-117. The young left arm spinner, Raza Hasan, (Pakistan) was declared ‘Player of the match’ for his excellent bowling spell of 4-0-14-2 wickets. The 23rd match of the ICC World Twenty20 was staged on Tuesday, October 2, 2012, at R Premadasa Stadium, Colombo. The Australian captain, George Baliey, was successful with the toss but preferred to field first. The dismal batting form of the Pakistani skipper, Mohammad Hafeez, continued in the tournament since he was declared leg before wicket off Mitchell Starc for just four runs on the first ball of the second over. The newcomer Nasir Jamshed was dropped two balls later in the first slip by Glenn Maxwell as the other opener, Imran Nazir, hit a couple of fours in the fifth over. 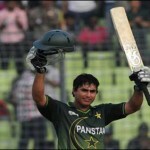 Imran Nazir also remained unimpressive and was gone for 14 runs as Kamran Akmal joined in with Nasir Jamshed. The duo kept the score board moving and geared up from the 10th over where 11 runs were scored with two fours. Nasir Jamshed dispatched two sixes in the next couple of overs and completed his second T20 fifty with a four in the 14th over. Kamran Akmal scored his first six in the same over and the hundred of the innings also appeared on board. The third wicket partnership contributed 79 runs in 55 balls and enhanced the score to 108 when Nasir Jamshed was caught at long-on by David Warner off Xavier Doherty for 55 off 46 balls with 2 lofty sixes and 4 fours. Kamran Akmal departed two balls later without any addition to the total for 32 off 26 with 1 six and 1 four. Abdul Razzaq scored 22 off 17 with 1 six and 2 fours as Pakistan piled up 149 runs for the loss of six wickets in 20 overs. Mitchell Starc was the star performer with three wickets whereas Xavier Doherty, Shane Watson and Pat Cummins shared one wicket each. The aggressive Australian openers, Shane Watson and David Warner, found it difficult to negotiate with the quality spin bowling of the Green Shirts and managed to score just 13 runs in the first three overs. Watson was declared leg before wicket off Raza Hasan in the next over for eight runs. Warner lost his wicket in the same fashion on the last ball of the following over from Mohammad Hafeez for eight runs as well. The Kangaroos were two wickets down for 15 in five overs as Michael Hussey and George Bailey tried to take their team out of trouble. The runs were difficult to score and they crept to 44 in 9.3 overs when Saeed Ajmal got rid of Bailey for 15. Cameron White was the next batsman in, who tried to accelerate the scoring but was caught at wide long on by Imran Nazir off Mohammad Hafeez for 12. The Aussies were suffering at 5-65 in 13.3 overs when Michael Hussey took over and demonstrated thoughtful batting ably supported by Matthews Wade from the other end. The hundred of the innings appeared on board in the 17th over and Australia required 45 to win in the last 12 balls but they had to score 112 runs to qualify for the semi final. The score was taken to 110 in 18.4 overs when Saeed Ajmal clinched two wickets on his last two deliveries. Michael Hussey achieved his fourth T20 half century on the first ball of the last over with a four and the Kangaroos qualified for the semi final spot. Michael Hussey remained unbeaten for 54 off 47 with 1 six and 4 fours as Australia managed 117 runs with three wickets in hand when the last ball of the 20th over was bowled. Saeed Ajmal was the highest wicket taker with three, the young Raza Hasan was the most impressive one in the early overs and claimed two wickets, while Mohammad Hafeez also secured two. Pakistan won the match with a margin of 32 runs and they anticipate becoming the fourth team to qualify for the semi finals.